2. A sudden falling off or decline, as in activity, prices, or business. 3. An extended period of poor performance, especially in a sport or competitive activity. Whichever one of the aforementioned definitions you choose, I believe you could make a case for how just about any one of them applies to the Pittsburgh Penguins. After a hot start to the season, It looks like the Pens have reached their first stretch of less than spectacular play, highlighted by a loss to the bottom-feeder Philadelphia Flyers that left us shaking our heads. Then I opened up Twitter. My goodness you would have thought that Dan Bylsma had just urinated on the Roberto Clemente statue while Kris Letang and Evgeni Malkin were down in the basement with Rob Ford. Crosby scored the only Pens goal in a game that could have easily gone the other way. It seems that whoever the Penguins play as of late comes to the game having ingested a potion that makes their goalie absolutely incredible. Or could it be Gamma Radiation? possibly other-worldly intervention? Doubtful. I think what we are seeing is Humanity plain and simple. As much as we would like to believe that our hockey idols are no less than Demi-Gods in black and gold Sweaters, it has become readily apparent to even the most colorful of imaginations that whether your last name is Crosby, Malkin, Fleury, or Letang, they are all just human. Incredibly talented, hard-working, ticking time-bombs made of flesh and blood, that sometimes fail to live up to the hype that we so generously pour over them. Don't get me wrong, They are professional athletes, and they need to play better. Winning is what is expected of our Penguins, that is the culture of which we are accustomed. Our stars need to play like stars, our coaches need to rotate the lines to match up with the opposition. Things need to be done to remedy the streak of futility that the team currently finds itself in. But calling for trades? Coaches getting fired? After a string of a few losses following the departure of two of our top defensemen due to injury no less? Let's sit back and take our situation into perspective. We know what Crosby can do. We know what Malkin is capable of, and we all know that Kris Letang can be a Norris caliber defenseman when he decides to show up. Ray Emery only allowed one goal against the Penguins, does this mean you would rather have him sitting between the pipes on a nightly basis? Of course not. The Penguins sit atop the Metropolitan Division. 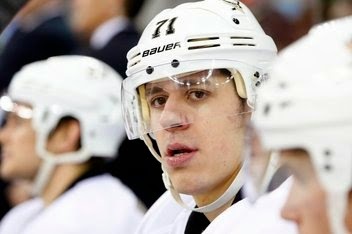 Even riding a three game losing streak, the Pens are the odds-on favorite to take flight and make this race a laugher. With the natural ability this team has, and the level of play we know they are capable of, the fact that our fan base still finds things to complain to heartily about is somewhat disconcerting. We love to watch this game for a reason, it's what makes us come back night after night, and if things always went according to plan, what in the world would we have to cheer for? Many teams would kill for the opportunity to have the type of talent on their squad that we have hanging around Consol Energy Center. We as a fan base need to take a step back and realize that the games will not always be won, our players will not always play their best, and occasionally the other team will win. Take care of each other out there everyone. Look out for your fellow fan, and Let's give that world-class talent a chance to get things together before we throw them to the wolves.